Class Format: On-demand teleclass to take anytime, at your convenience. You will receive links to 4 1/2 hours of MP3 recordings (from a live class which includes the questions, comments and interactions of the participants with the instructor) and PDF’s containing 47 pages of detailed handouts. 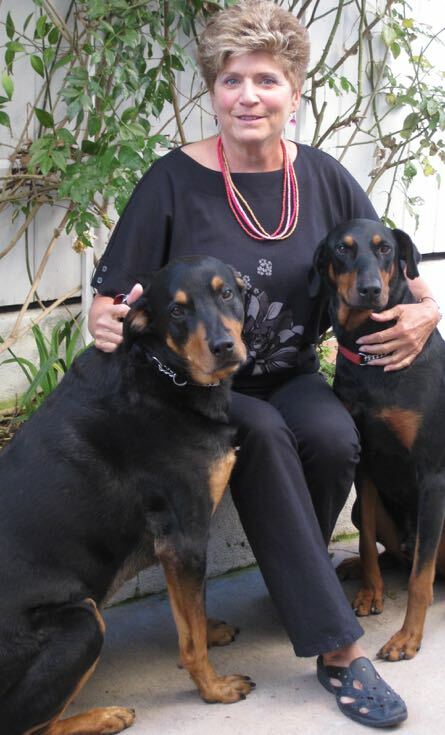 Who Should Attend: This class is suitable for both anyone who wants to help their own beloved animals and for professionals who work with animals and their people to explore the benefits of using telepathic animal communication as a powerful resource to emotionally support and gain valuable information from animals when they are ill, near end-of-life, after death and as a support when grieving. This class does not teach animal communication skills, but does thoroughly describe how it works, the professional ethics involved, and the benefits of using it or referring clients to this service when appropriate. Learning that our animals are seriously ill or near end-of-life can begin a period of great challenge. We may be scared, confused, overwhelmed, become paralyzed by shock or bury ourselves in research about medical options (sometimes not just to gather information but to avoid our feelings)—all of which is normal. It is hard to remain emotionally centered and present during such times. Though animal communication is certainly not a panacea that can cure illness or make the loss of our animal loved ones emotionally painless, it does hold tremendous potential to make these sacred times with our animals more informed, more intimate, filled with more meaning than fear, and provide us with more confidence as we make decisions for our animals’ care when we have their opinion and perspective. 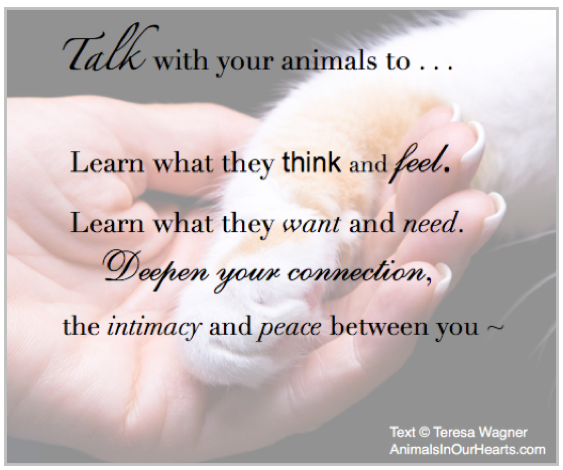 As vital as the information is about the physical health and behavior of our animals—and animal communication is never meant to replace this—information that is intuitively derived provides us with facts and feelings directly from the animals. It provides us with information beyond biology and behavior for a more whole and complete picture of what is happening with our animal during times of illness and end-of-life. Receive answers to questions we or our veterinarians may have such as: Where is the pain? Is it sharp or more like an ache? How long has it been there? Do you feel better since receiving the new medication last week? Bring the energy of grace to what can be one of the most difficult experiences of our lives. Animal communication should never be used as a substitute for veterinary care. 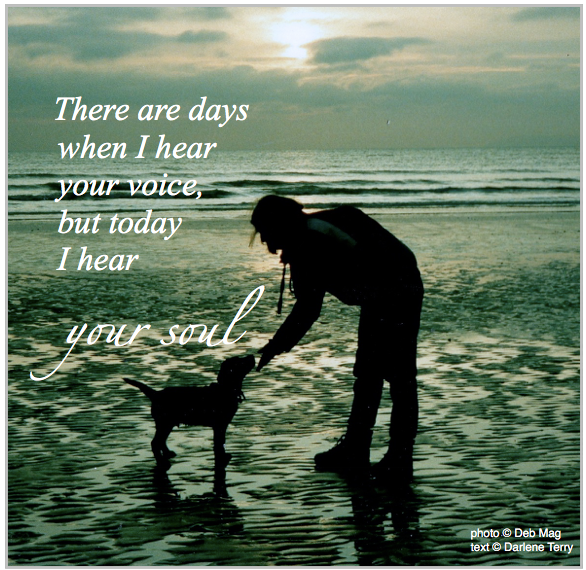 Animal communication can help us gain information about our animals’ perspective of their physical health. It can help us get answers to questions about their physical symptoms and help us know how they are feeling emotionally. Though this type of information can assist with veterinary care, animal communication should never, ever be used instead of medical diagnoses or medical care. If your animal is physically ill, seek veterinary medical care. To further understand the ethical use of animal communication, you may be interested in the class Introduction to Telepathic Animal Communication. Ethical, competent animal communicators do not subjectively interpret what they receive from animals or tell their clients what to do. Rather, they help their clients make sense of the information they’ve gathered from the animals, and support their clients as they make their own decisions about it. Just hearing the stories on Day #2 could bring a lot of assurance for people who find themselves dealing with life and death issues with their pets. 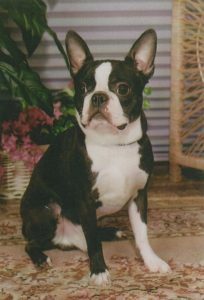 I currently work with a number of clients who have pets with tumors/cancers, seizures, insomnia and other ailments. It is an emotional time for them and I do my best to be a good listener, to provide encouragement, to assure them that their pet appreciates and loves them and to give them their pet’s point of view. With the information and experiences provided during the workshop, I feel better prepared to assist people and pets as they go through illness and end of life experiences. I already utilize many of the basic strategies. However, this class gave me more details, more ideas, more options to provide to pet parents dealing with illness and end of life situations. It was very affirming for me to hear what Teresa had to say as well as the stories by the 6 guests on the second day. Teresa is very easy to listen to and did a very good job in presentation. You can feel the warm, loving energy in her voice and I felt very aligned with the information that she presented. It was a topic that was very timely for me. Made me feel like I’m not alone, that we all go through different levels of grief. You’re amazing and I love you Teresa. Thank you for sharing your gifts with the world. We couldn’t have gone through our grief and help our animals without you! What was so valuable was hearing other people’s specific experiences in order to better understand the breadth of them AND to really hear how people FELT when their animal let them know what he/she needed. Discussing/acknowledging the grieving process is sooo helpful. Any information or relaying of experiences by others helps to expand my deepening understanding of animal communication. Handouts very comprehensive, well written and beautifully illustrated. I also liked the clarity in the handouts about what animal communication “is” and “is not”. Teresa did a wonderful job of taking that deeper during Class 1. References are very much appreciated. Teresa was amazing. Clear, kind, so very experienced, generous, organized. The end meditation was wonderful. The information is pertinent, well organized and plentiful. Connecting with other kindred spirits is comforting. One participant shared his feelings of being closer to his beloved cat(s), than to human family members. What a relief to know that other humans experience an emotional inter species bond, as I do! It is relevant, that we are able to respect our animal’s wishes, rather than guess, and regret. When a pet expresses whether or not they are ‘ready’ to leave their body, it relieves the worry and pressure, of questioning if we acted too soon, or prolonged pain and suffering too long. Animal communication provides peace of mind, during the entire process, from initial illness diagnosis, extent of treatment provided, thru death. If they need assistance to make the transition, guilt is not a factor. We are merely following what they want, with unconditional love. We grieve, yet stay connected, despite the lack of physical presence. My most significant learning from this class is that despite the common theme of death and grieving pet loss, every experience is unique. Everybody deals in their own manner, on their own timeline, and from the context of their personal frame of reference. I learned to be non judgmental. There is no right or wrong way to feel. Grieving is a process that we must go thru, as a result of having loved. Love outlasts grief. It is the strongest emotion and force on earth. Since I am more visual than auditory, the handouts are a great resource to process and review the information. They are available to print, and retain for future reference. The text, interspersed with graphics, relays the information with clarity, in perfect ratio. I personally love the handouts, save them, review details regularly, and absorb more deeply, with an accompanying AHA moment! I would highly recommend this on-demand class. It would be helpful for anybody who has a pet, has ever lost a pet, is facing difficult decisions regarding treatment, surgical intervention, and end of life decisions. So important for an animal to be informed of what to expect, and give consent, before each procedure, in the interest of alleviating fear and respecting their wishes. Furthermore, when there are surviving animals, we need to provide them with closure, explaining what happened to a deceased household member, and ask how they feel about getting another pet and, if so, when? I realized for the first time how important it is to have a three-way conversation with the animals, communicator, and human guardian. I had also not before considered how important it is to communicate during times of illness, and hospice. Teresa, your classes are always phenomenal. The handouts were excellent! Teresa is phenomenal! Her compassion, caring, love and knowledge are beyond compare. We all have stories. However, these guest speakers went above the call to share extremely painful and powerful experiences. I thank them all! This class deepened my understanding of animal communication during hospice and palliative care. I loved the depth of details, ie., asking the animals their preferences and explaining procedures in advance, the handouts, and the varied experiences of the guest speakers. I was also greatly impacted by the story of Walker, the wolf-hybrid, and the challenging journey he and his companion shared together. The handouts Teresa provides are a guide to follow and the pictures/graphics make an idea memorable. Experience counts, and Teresa’s loving spirit is legendary! I have purchased other on-demand classes and always love the depth that is presented. I have attended 3-day workshops by other animal communicators on this same subject that left me asking why did I bother. Just being with those I would consider “my tribe” was worth every minute, every penny…but I also learned so much! I have 5 dogs currently over the age of 8 and I know I will use this information help when the time comes. 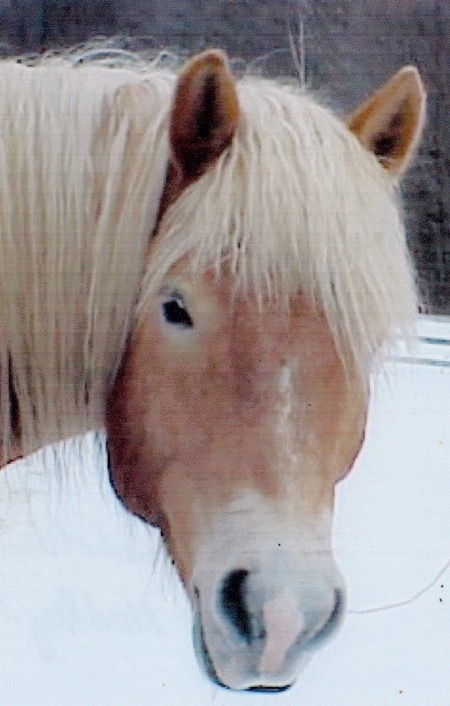 I was already of the belief that animal communication would help me find out whether my animal might want help to leave this world, but I have now learned there is an “art” to helping them leave as well…how to make it as beautiful as possible. I think the MOST significant learning was that there can be an “art” in helping my beloved animals transition. I can now consider this individually for my animals when the time comes – how and what to do to help based on that particular animal. Teresa, as always, was the BEST teacher ever! Intelligent, compassionate – even with the small discussion at the end of session 2 about compassionate gardening…I am dealing with this very problem and now I have a solution! I will also be purchasing the book Perelandra – Thank you! OMG! Craig Seemans story has given me great hope as to my chances of finding my beloved Zowie when he returns! And Birgit’s description of how she helped Ala pass has given my hope and ideas of how to best handle the inevitable. All of the speakers gave something of value!